Objectives: Whether T-cell–mediated rejection Banff classification type Ib (severe tubulointerstitial rejection) and type IIa (mild vascular rejection) are associated with responses to antirejection therapy and long-term graft survival are unclear. Materials and Methods: One hundred ten patients were enrolled who had at least 1 episode of T-cell–mediated rejection and whose highest T-cell–mediated rejection severity was T-cell–mediated rejection type Ib or IIa. Results: T-cell–mediated rejection Ib occurred significantly later than T-cell–mediated rejection IIa (P < .001). The proportion of partial/no response to antirejection therapy was comparable between the 2 groups (P = .83). Up to 8-year posttransplant, death-censored graft survival rate of the T-cell–mediated rejection Ib group was similar to that of the T-cell–mediated rejection IIa group (P = .51). Early T-cell–mediated rejection IIa had a statistically higher death-censored graft survival rate than did late T-cell–mediated rejection IIa (P < .001), while no significant difference in the death-censored graft survival was found between early and late T-cell–mediated rejection Ib (P = .11) or between early T-cell–mediated rejection Ib and early T-cell–mediated rejection IIa (P = .11) or between late T-cell–mediated rejection Ib and late T-cell–mediated rejection IIa (P = .07). Furthermore, the T-cell–mediated rejection IIa with isolated v1 lesion (v1, i0-1, t0-1) showed a similar death-censored graft survival rate compared to T-cell–mediated rejection IIa with intensive tubulointerstitial inflammation (v1, i2-3, t2-3). The timing of rejection, graft number, the number of indicated biopsies and the presence of ci/ct lesions were associated with long-term graft loss. Conclusions: The designation of T-cell–mediated rejection type Ib and IIa reflects the different type rather than the distinct severity of rejection and has no independent prognostic significance. T-cell–mediated rejection (TCMR) is an important event in organ transplant.1 The diagnosis of TCMR in troubled kidney transplants relies heavily on inflammatory lesions, including interstitial inflammation (i lesions), tubulitis (t lesions), and intimal arteritis (v lesions), which are semi-quantitatively graded by arbitrary thresholds. The Banff category of TCMR is redefined into 3 types: type I refers to moderate (Ia) and severe tubulitis (Ib) free of v lesion; type II refers to mild (IIa) and moderate intimal arteritis (IIb), and type III refers to severe arteritis.2 The scored i, t, and v lesions are supposed to associate with initial responses to antirejection treatment, allograft function, and long-term graft outcome.3 Some research has demonstrated that vascular rejection (with v lesions) has a likelihood of steroid resistance and evokes a scarring process, while tubulointerstitial rejection (free of v lesions) has little unfavorable effect on graft function.4,5 Although intimal arteritis can be extremely focally distributed, the diagnostic criteria of vascular rejection in the Banff classification rely only on the presence of v lesions regardless of the extent of t or i lesions.6 However, Nickeleit and associates7 have reported that the increasing grade of tubulitis correlates with a greater graft failure rate within the first year posttransplant in grafts with vascular rejection because severe tubulitis significantly disrupts the tubular architecture and enhances the development of chronic scarring. In addition, the term isolated v lesion was proposed in 2009 at the Banff conference, which was defined as mild intimal arteritis with minimal interstitial inflammation (TI) without C4d deposition in peritubular capillaries.8 It is still unclear whether the designation of TCMR types Ib and IIa in the Banff working classification of renal allograft pathology correlates with distinct rejection severity and associated clinical outcomes. 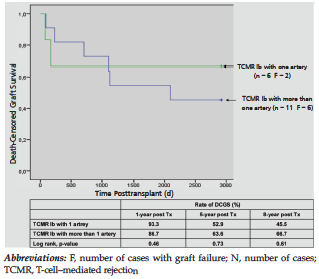 We therefore performed this retrospective study to address the following issues in TCMR only cases (negative for donor-specific antibodies and C4d): (1) whether the designation of TCMR types Ib and IIa are relevant to distinct graft outcomes; (2) whether the extent of tubulointerstitial inflammation influences the outcome of grafts with isolated v1 lesion; and (3) whether the timing of TCMR types Ib and IIa have prognostic value for predicting graft loss. From January 1, 1996, to December 31, 2010, one thousand eighty-three adult patients (≥ 18 years old) received a kidney transplant in our center and were follow-up for at least 6 months. We defined TCMR types Ia, Ib, IIa, IIb, and III in this study as representing low to high TCMR severity. For each patient, only the biopsy specimen showing highest the TCMR severity was used. After excluding 973 patients based on the criteria detailed in Figure 1, this study enrolled 110 patients who had at least 1 episode of TCMR type Ib or IIa. One hundred ten biopsies, which were diagnosed as TCMR type Ib or IIa, were enrolled and separately studied. In addition, the enrolled biopsies were separated into early (timing of biopsy ≤ 6 mo) and late groups (timing of biopsy > 6 mo). Delayed graft function was determined by the need for dialysis within 1 week posttransplant.9 Death-censored graft failure was defined as returning to chronic dialysis. All clinical and laboratory data were recorded at each visit in our transplant database system. This study was approved by the institutional review committee. All protocols conformed with the ethical guidelines of the 1975 Helsinki Declaration. Informed consent was obtained from all subjects. End of observation was December 31, 2010. An ultrasound-guided biopsy was performed within 24 hours of treatment unless technically or logistically impossible or medically contraindicated (ie, elevated serum creatinine [SCr] or proteinuria). Biopsy specimens were processed with standard techniques in the Department of Pathology, Charite Campus Mitte. Slides were reviewed by a local nephropathologist (B. R.) according to the updated “09 Banff working classification, updated in 2009.”8 For each biopsy, we recorded the number of tissue cores and the number of glomeruli and arteries present. An adequate sample was defined as a minimum of 7 glomeruli and 1 artery. The histologic lesions included glomerulitis (g), interstitial inflammation (i), tubulitis (t), intimal arteritis (v), peritubular capillaritis (ptc), chronic allograft glomerulopathy (cg), interstitial fibrosis (ci), tubular atrophy (ct), fibrous intimal thickening of arteries (cv), arteriolar hyaline thickening (ah), and increasing mesangial matrix (mm), which were all scored on a scale of 0 to 3 according to the proportion of cortical area affected; higher scores indicated more severe abnormalities. C4d was stained on paraffin sections using a polyclonal anti-C4d antibody by indirect immunofluorescence; the biopsies from the preC4d era were retrospectively tested for C4d. Tubulitis and interstitial inflammation in atrophic areas were ignored in accord with the recommendations of the Banff schema. T-cell–mediated rejection was defined based on C4d and donor-specific antibodies negativity. T-cell–mediated rejection Ib referred to histologic indices v0, i3, t3, and TCMR IIa referred to v1, i0-3, t0-3. Since 1996, the immunosuppression protocol was composed of cyclosporine/tacrolimus, mycophenolate mofetil/azathioprine, and methylprednisolone. The dosages of cyclosporine and tacrolimus were adjusted according to whole blood trough levels. Antirejection therapy involved 2 broad steps: the pulse therapy of corticosteroids, and the steroid-resistant acute cellular rejection received antibody therapy (anti-thymocyte globulin or rituximab) plus additional therapeutic plasmapheresis. Complete, partial, and no-reversibility were defined by Gaber and associates12 based upon comparison of the SCr concentration at 1 month postbiopsy with the prebiopsy level. All data were assessed for completeness by a single investigator (S. D.). Continuous variables were expressed as means ± standard deviation. Categorical variables were expressed as n and percentage of total. The t test was used to compare 2 groups of continuous variables and the chi-square was used for categorical data. Survival curves were analyzed by Kaplan-Meier graphs and statistically compared by the log-rank test. To test putative risk factors for long-term graft loss, the clinical and histologic features were tested in multivariate Cox-regression analyses. All statistics were performed by using SPSS software (SPSS: An IBM Company, version 16.0, IBM Corporation, Armonk, NY, USA). P values < .05 were considered significant. During the study, 110 adult patients and 110 biopsies were analyzed including 47 of TCMR Ib and 63 of TCMR IIa. Demographic data are listed in Table 1. No significant difference in baseline characteristics was found between the TCMR Ib and IIa groups. However, the average number of grafts was higher in the TCMR IIa group compared with the TCMR Ib group (mean 1.3 vs 1.0; P = .005), and the TCMR IIa group had higher proportion of unknown causes of end-stage kidney disease compared with the TCMR Ib group (19.0% vs 4.3%; P = .02). 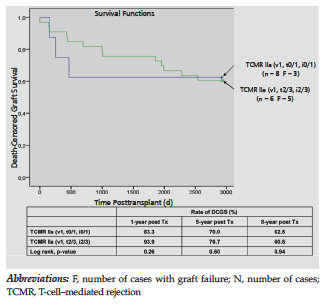 As shown in Table 2, the mean duration of follow-up after transplant was 6.3 ± 3.8 years in the TCMR IIa group compared with 4.3 ± 3.3 years in the TCMR Ib group (P = .92); the 2 groups had similar numbers of clinically indicated biopsies during the study period, but the onset timing of TCMR Ib was later than that of TCMR IIa (15.1 vs 4.8 months; P < .001). Baseline concentration of SCr (1 month prebiopsy) was similar between the 2 groups; at biopsy, the SCr concentration of the TCMR IIa group was elevated to a mean of 468.5 μmol/L (5.3 mg/dL), significantly higher than the value of 318.2 μmol/L (3.6 mg/dL) measured in the TCMR Ib group (P = .001). At 2 weeks postbiopsy, the SCr concentration of the TCMR IIa group dropped to 353.6 μmol/L (4.0 mg/dL) (P = .03). At 1 month postbiopsy, the mean SCr of the Ib and IIa groups fell to a similar baseline level. The trough levels of the cyclosporine or tacrolimus were comparable pre- and at postbiopsy between groups Ib and IIa. The patients of the 2 groups underwent similar antirejection therapy. There was no significant difference in initial response to antirejection therapy between 2 groups. Significantly more arteries were present in biopsies from the TCMR IIa group compared with the TCMR IIb group (mean 2.1 vs 1.4; P < .001). The mean ptc score was significantly higher in the TCMR Ib group compared to the TCMR IIa group. The Kaplan-Meier curves of cumulative functional graft survival are shown in Figure 2. During this study, a total of 24 recipients returned to chronic dialysis, 8 from the Ib group and 16 from the IIa group. The death-censored graft survival (DCGS) rate at 8 years postTx was comparable between the 2 groups (52.9% vs 61.0%; P = .51). Up to 8 years postTx, the DCGS rate of late-onset TCMR IIa was relatively lower than that of late-onset TCMR Ib (16.7% vs 66.7%; P = .07), and the DCGS rate of early-onset TCMR IIa was relatively higher than that of early-onset TCMR Ib (68.6% vs 45.5%; P = .11) (Figure 3A). In addition, within the TCMR Ib or IIa groups, early- or late-onset TCMR Ib had similar DCGS rates at each time point postTx; in contrast, early TCMR IIa had a significantly higher DCGS rate compared with late TCMR IIa; remarkable differences were found at 5 and 8 years postTx (Figure 3B). In the TCMR IIa group, 12 biopsies showed minimal TI lesions (v1, t0-1, i0-1), and 51 biopsies showed intensive TI lesions (v1, t2-3, i2-3). The DCGS rate up to 8 years postTx was 62.5% versus 60.6%; P = .94 (Figure 4A). 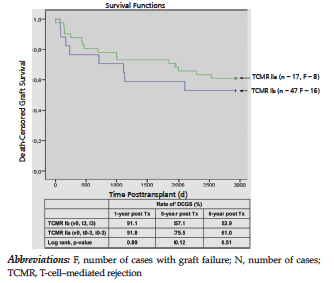 The time of biopsy, the graft number and the number of indicated biopsies were associated with graft failure at 8 years postTx in all patients. In the TCMR Ib group, the number of biopsies, the time to biopsy, SCr levels at biopsy, and living donation correlated with long-term graft loss. 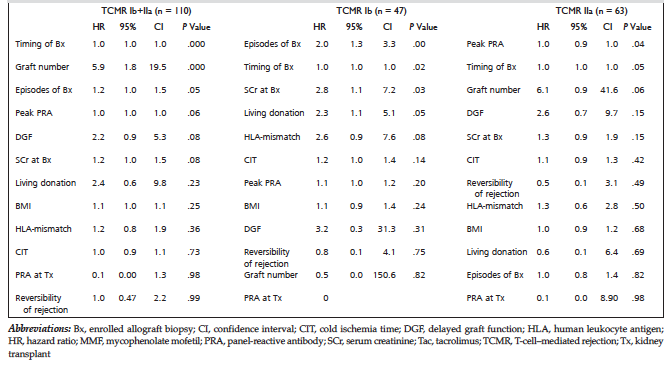 In the TCMR IIa group, peak panel reactive antibodies (PRA) and the timing of biopsy were associated with graft loss (Table 3A). 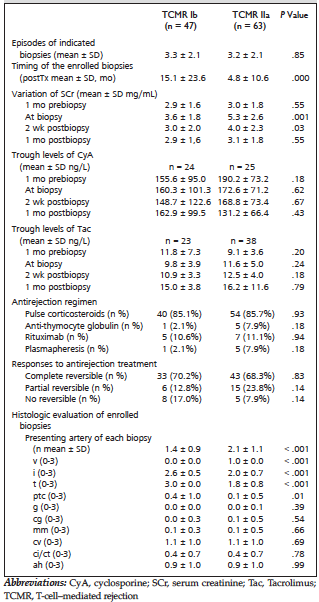 The association of Banff scored lesions with long-term graft loss is shown in Table 3B. The ci/ct lesions were independent predictors for long-term graft loss. We retrospectively studied 110 biopsies, showing the highest rejection severity for the corresponding patients, TCMR Ib or IIa. Our data demonstrated that the TCMR type Ib and IIa groups had a similar likelihood of complete reversibility in response to antirejection therapy. The current immunosuppression protocol may be responsible for the good outcome, because this obviously has reduced the incidence and frequency of acute rejection as well as the failure to respond to antirejection therapy. The significant deterioration of graft survival might relate to partial biopsy-proven acute rejection, which responds incompletely to antirejection treatment. Incompletely reversible biopsy-proven acute rejection can lead to more clinically indicated biopsies and increase the risk for subsequent late rejection, both of which result in persistent and progressive parenchymal damage and accelerated graft failure.13,14 In addition, the long-term graft survival rates were comparable between the 2 TCMR groups, which were negative for C4d and donor-specific antibodies. Our data are in accordance with a recent study of Lefaucheur and associates,15 who reported that compared with acute cellular interstitial rejection, the risk of graft loss was 9.07 times higher in antibody-mediated rejection with v lesions, 2.93 times higher in antibody-mediated rejection without v lesions, while there was no significant increase in acute cellular vascular rejection. Secondly, we observed that TCMR IIa with either minimal TI (isolated v lesions) or with intensive TI had similar long-term graft outcomes, indicating that the designation of isolated v lesions does not reflect a distinct severity of acute vascular rejection. Our findings are incompatible with the study of Minervini and associates16 who reported that acute rejection with mild intimal arteritis plus severe tubulitis is associated with a worse graft outcome than cases with mild-to-moderate tubulitis. A working group consisting of 144 biopsies of isolated v lesions from 7 centers concluded that after exclusion of antibody-mediated rejection, some isolated v1 lesions occurred early after transplant in both compatible and incompatible renal transplant recipients, and were thought to represent ischemic changes associated with delayed graft function, but had no independent prognostic significance.17 Similarly, there was no evidence in this study to support the hypothesis that severe interstitial inflammation worsened the long-term prognosis in the TCMR IIa group. Another aim of this study was to observe the effect of time to enrolled biopsy on graft outcome. The majority of TCMR IIa cases occurred within the first 6 months before transplant, obviously earlier than TCMR Ib, with an average interval of 15 months. The interval between transplant and enrolled biopsy was proven to be associated with graft failure at 8 years after transplant. Although this finding is at odds with the similar long-term graft outcome between the 2 groups, 1 possibility is that the 2 groups had the same score of ci/ct lesions, which are more directly associated with deterioration of graft function. Moreover, early and late TCMR Ib had similar long-term DCGS rates; but late TCMR IIa showed a significantly lower DCGS rate compared with early TCMR IIa. Late-onset acute rejection, especially vascular rejection, had a deleterious effect on long-term graft survival. Only 37.5% grafts with late TCMR IIa survived 5 years after transplant. This proportion was less than half of the early TCMR IIa group (82.2%). One possible explanation is that TCMR in the absence of antibody-mediated rejection is supposed to be responsive to steroid therapy and thought to pose little direct long-term risk in adherent, well-managed patients, even with endotheliitis or late episodes of rejection.18 Moreover, intimal arteritis confers no additional risk when it occurs in TCMR and probably only effects survival through antibody-mediated rejection. 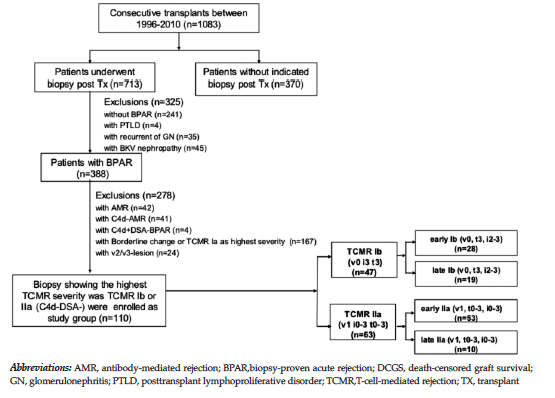 However, end-stage human kidney transplants with severe TCMR usually have concomitant antibody-mediated rejection, and the bad reputation of late TCMR is probably due to unrecognized antibody-mediated rejection.19 We previously excluded biopsies which showed C4d or donor-specific antibodies positivity from this study; it was nevertheless possible that we missed some cases of AVR with undocumented components of antibody-mediated rejection, because the detection of multilayered basement membrane of peritubular capillaries by electron microscopy, or C1q-fixed donor-specific antibodies, or non-HLA antibodies, was not routinely used for all biopsies. Besides the inflammatory lesions, chronic graft scarring with high-grade interstitial fibrosis (ci lesions) and tubular atrophy (ct lesions) act as independent risk factors for the development of graft dysfunction.20 The ci/ct lesions are not a disease itself, but a feature of all progressive kidney diseases. Our study found the extent of ci and ct lesions was significant and an independent predictor of graft deterioration over the ensuing 8 years after transplant. Histologically, intensive ci/ct lesions commonly exist in late allografts and indicate the cumulative burden of injury and disease.21 Once severe scarring and atrophy are present, the diagnosis of TCMR becomes nearly impossible because the unscarred compartment is too small, and the inflammation because the injury-repair response is extensive. It has been reported that early ci/ct lesions have an immune basis and indicate subclinical rejection, tubulointerstitial disease, and the residua of previous episodes of clinically evident acute rejection, whereas later ci/ct lesions, combined with progressive vasculopathy and glomerulosclerosis, are to a large extent accelerated by nonimmune events such as polyoma nephropathy and recurrent pyelo-nephritis.22 Nevertheless, it should be emphasized that a more-direct approach to limit atrophy and fibrosis has a greater long-term benefit. Our study belongs to the postcyclosporine era that entails wide and effective options in immuno-suppression, which has markedly reduced the frequency and severity of acute rejection. Our research is based on experience at a single institution, which is helpful in limiting the management variability of acute rejection over the course of the study. All clinically indicated graft biopsies are interpreted by 1 nephropathologist, who has more than 10 years of experience with the Banff classification. Diagnoses have been used to guide clinical care and immunosuppressive management per local protocols. However, the moderate sample size has prevented us from conducting more extensive regression modelling and in this regard, a multicenter collaborative approach is likely to be required to reach this goal. In summary, our study demonstrates that the designation of TCMR Ib and IIa in Banff classification reflects the different type rather than the distinct severity of rejection, and has no independent prognostic significance. Except for late onset TCMR IIa, TCMR Ib and early TCMR IIa are responsive to current immunosuppression protocols and have relatively good long-term graft outcomes. Nevertheless, the extent of TI has little influence on graft outcome in the TCMR IIa group; the arbitrary designation of isolated v1 lesion seems biologically implausible and requires reassessment. Mueller A, Schnuelle P, Waldherr R, van der Woude FJ. 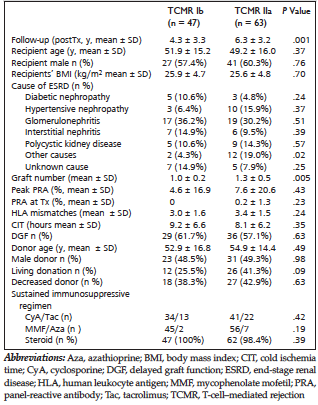 Impact of the Banff '97 classification for histological diagnosis of rejection on clinical outcome and renal function parameters after kidney transplantation. Transplantation. 2000;69(6):1123-1127. Minervini MI, Torbenson M, Scantlebury V, et al. Acute renal allograft rejection with severe tubulitis (Banff 1997 grade IB). Am J Surg Pathol. 2000;24(4):553-558. Sis B, Einecke G, Chang J, et al. Cluster analysis of lesions in nonselected kidney transplant biopsies: microcirculation changes, tubulointerstitial inflammation and scarring. Am J Transplant. 2010;10(2):421-430. Solez K, Axelsen RA, Benediktsson H, et al. International standardization of criteria for the histologic diagnosis of renal allograft rejection: the Banff working classification of kidney transplant pathology. Kidney Int. 1993;44(2):411-422. Macdonald FI, Ashraf S, Picton M, et al. Banff criteria as predictors of outcome following acute renal allograft rejection. Nephrol Dial Transplant. 1999;14(7):1692-1627. Racusen LC, Solez K, Colvin RB, et al. The Banff 97 working classification of renal allograft pathology. Kidney Int. 1999;55(2):713-723. Nickeleit V, Vamvakas EC, Pascual M, Poletti BJ, Colvin RB. The prognostic significance of specific arterial lesions in acute renal allograft rejection. J Am Soc Nephrol. 1998;9(7):1301-1308. Sis B, Mengel M, Haas M, et al. Banff '09 meeting report: antibody mediated graft deterioration and implementation of Banff working groups. Am J Transplant. 2010;10(3):464-471..
Huber L, Lachmann N, Dürr M, et al. Identification and therapeutic management of highly sensitized patients undergoing renal transplantation. Drugs. 2012;72(10):1335-1354. Liefeldt L, Brakemeier S, Glander P, et al. Donor-specific HLA antibodies in a cohort comparing everolimus with cyclosporine after kidney transplantation. Am J Transplant. 2012;12(5):1192-1198. Gaber LW, Moore LW, Alloway RR, et al. Correlation between Banff classification, acute renal rejection scores and reversal of rejection. Kidney Int. 1996;49(2):481-487. Salmela KT, von Willebrand EO, Kyllönen LE, et al. Acute vascular rejection in renal transplantation--diagnosis and outcome. Transplantation. 1992;54(5):858-862. Lefaucheur C, Loupy A, Vernerey D, et al. Antibody-mediated vascular rejection of kidney allografts: a population-based study. Lancet. 2013;381(9863):313-319. Shimizu T, Tanabe T, Shirakawa H, Omoto K, Ishida H, Tanabe K. Acute vascular rejection after renal transplantation and isolated v-lesion. Clin Transplant. 2012;26(suppl 24):2-8. Sellarés J, de Freitas DG, Mengel M, et al. Inflammation lesions in kidney transplant biopsies: association with survival is due to the underlying diseases. Am J Transplant. 2011;11(3):489-499. Famulski KS, Einecke G, Sis B, et al. Defining the canonical form of T-cell-mediated rejection in human kidney transplants. Am J Transplant. 2010;10(4):810-820. Ahmed K, Ahmad N, Khan MS, et al. Influence of number of retransplants on renal graft outcome. Transplant Proc. 2008;40(5):1349-1352. Gjertson DW. A multi-factor analysis of kidney regraft outcomes. Clin Transpl. 2002:335-349. Acknowledgements: The authors have no conflicts of interest to disclose, and there was no funding for this study. Dr Kaiyin Wu participated in the performance of the research and writing the paper; Prof Klemens Budde participated in the research design; Dr Danilo Schmidt participated in data administration; Prof Hans-H Neumayer participated in the research design; and Dr Birgit Rudolph participated in evaluation of pathologic slices, research design and writing.